Vantiv is a U.S.-based financial services company that provides payment processing solutions and technology services, processing 25 billion payment transactions annually (over $930 billion in volume) for merchants and financial institutions. Vantiv supports over 800,000 merchant locations and around 1,400 financial institutions. Vantiv is the second-largest merchant acquirer and the largest PIN debit acquirer based on the number of transactions in the U.S.
By looking ahead to the global expansion from their upcoming $10B merger with Worldpay, Vantiv’s QA organization knew that they would need to transform their approach to software quality in order to remain a leader in the fintech industry. This would require moving from manual to automated testing, and working toward risk-based continuous testing. Vantiv would then turn their focus to introducing orchestrated service virtualization, BI, and exploratory testing that would reduce time to market even further and lead to successful DevOps and continuous delivery initiatives. Tricentis was engaged to conduct a pilot. The pilot was completed on time and a roadmap for strategic automation of key applications was created. This pilot was 100% successful in the automation of key applications. Vantiv decided to start with 15 licenses of Tricentis Tosca as their automation solution. 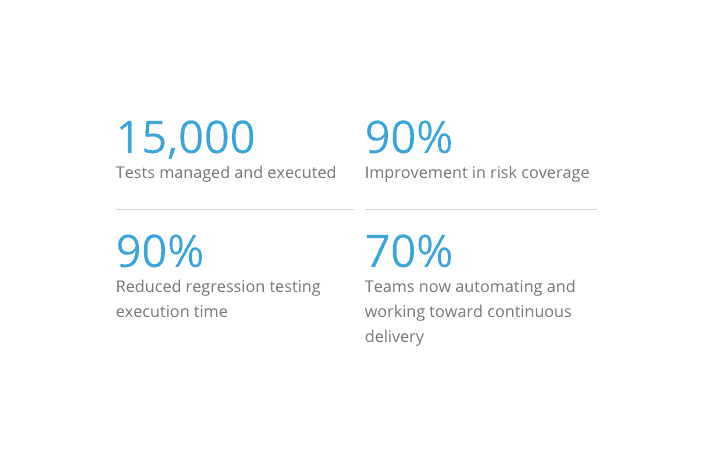 Following the purchase, Vantiv moved on to the bigger initiatives of improving regression testing risk coverage & continuous integration. An enterprise rollout plan was established as well as a roadmap for automation of regression backlog items for strategic applications. Tricentis partnered with Vantiv to provide support and guidance during the implementation of Tricentis Tosca across many different technologies. After the initial implementation, QA users could successfully execute and expand on the provided test portfolio as well as perform test data management by themselves.